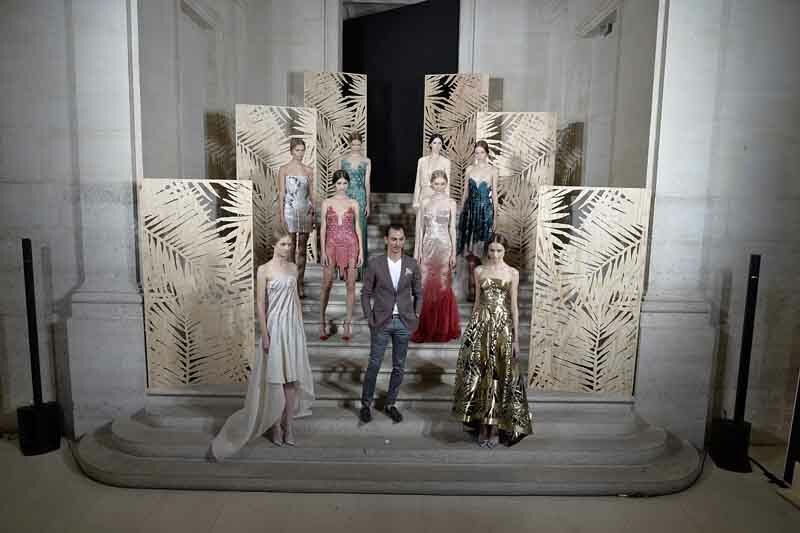 PARIS, Jul 9, 2014/ — On Monday, July 7th, Syrian-born designer Rami Al Ali unveiled his couture collection at the historic Musée des Arts Décoratifs which paid tribute to the mysteries of the hidden rainforest. Shrouded in enigma, an exquisite interplay between luxurious textiles and deliberate detailing stood centre stage in Al Ali’s twenty-piece collection which is meant to be consumed from varied angles yet producing a singular emotion – wonderment. Silhouettes captured curves and lines, skimming fluidly along the body. The classic A-line received a modern re-working, with cropped fronts of voluminous multi-layered skirts offering momentary glimpses of nature’s inner workings. Intricate embroidery and three-dimensional weaving allowed passageway into the rainforest’s innermost canopy – the hidden depth that lies beneath the surface. Fabrics added opulence to the untamed and wild inhabitants of Al Ali’s natural world, as a conscious blend of lace, silk organza, gazar, taffeta and chiffon lame formed a perfect base for the couturier’s signature luxurious finishes. Matte sequins and crystals elaborately embellished a colour palette which paid homage to drama, vibrancy and exoticism. Royal blue and vivid yellow, with jewel tones of ruby, purple and emerald, the newest collection thoughtfully explores the connection between the intensity of the jungle with its idyllic aspirations. Cementing that couture is craft; Rami Al Ali’s AW2014/15 collection brings innovation to the organic, elevating his art to higher levels.